Spiteful Bank is an engaging and challenging double-solitaire card game. Playing Online - if you find playing the computer opponent is too challenging, you can play a human through an Internet or LAN connection. Spiteful Bank is a 2-player double solitaire card game based on Crapette/Crapô or Russian Bank. The game is played with 2 decks of cards, 104 cards in total. Each player’s cards are dealt from their separate deck at the beginning of the game. Your cards are shown at the bottom of the screen. To be the first player to get rid of all their cards, by playing them to the Center Foundation, Tableau, or your opponent’s Reserve and Waste piles. Each player is dealt from their own deck. 13 cards are first dealt face down to the player’s right, forming the Reserve pile. The top card is turned face up. 4 cards are then dealt face up in a column above the player’s Reserve file, to form half of the Tableau. The remaining cards are the player’s Stock and are placed face down at the player’s left. Your cards are at the bottom of the game board and your opponent's cards are at the top. Stock, Waste and Reserve: Each player has their own Stock, Waste (or Talon) and Reserve piles. Center Foundation: The Center Foundation is made up of two vertical rows. 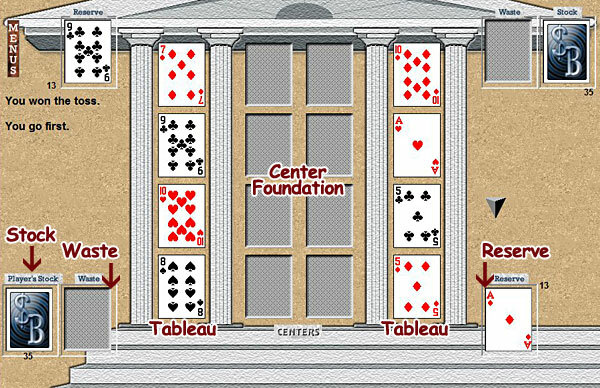 Tableau: The 2 vertical rows surrounding the center foundation are called "House" cards and they make up the Tableau. The Tableau and Center Foundation are the common play areas for both players. The player who goes first must begin the game by moving any aces from the Tableau to the Center Foundation. Normal game play then begins. If playable, the Reserve card must always be played first. If the Reserve card can be played to the Center Foundation, it MUST be played immediately. - Whenever a card is played from the Reserve, the card beneath it is immediately turned over. - If spaces are open in the Tableau, they must be filled from the Reserve before the Stock card can be turned over or played. - If cards are playable from the Tableau to the Centers, they must be moved there before turning over the Stock card. You can play an available card to the Center, Tableau, or to your opponent’s Reserve and Waste piles. “An available card” means a card from your Reserve, Stock (hand), or any card on the Tableau. Center Foundations – played in SUIT and ASCENDING sequence beginning with an ace: A2345678910JQK. Example: a 2 of hearts can only be played on an ace of hearts. Tableau – played in ALTERNATING COLORS (red suit on black suit) in DESCENDING sequence. Example: a 7 of Hearts (red) can be played on either an 8 of Spades (black) or 8 of Clubs (black). An empty Tableau space may be filled with a card of any suit or value. Opponent’s Reserve and Waste piles – played in SUIT in either ASCENDING or DESCENDING sequence. This is known as “loading” your opponent’s cards. Any visible Reserve or Stock card that can be played to the Center Foundation, MUST be played there immediately. While there are still cards in your Reserve pile, before your turn ends, if any Tableau cards can be played to the Centers, you MUST move them there. After your Reserve pile is empty, that restriction no longer applies. - Any Reserve or hand Stock card that can be played to a Center Foundation MUST be done so immediately. - The Reserve card has the highest priority in play. - An empty Tableau space must be filled from the Reserve pile before the Stock card is turned over. - If a Tableau space has been made by manipulating cards and both the Reserve and Stock cards are face up, the Reserve card MUST be placed there instead of the Stock card. If the Reserve is empty, the Stock (hand) can be played. - If more than one card can be played to the Center, an available Reserve card MUST be played there first. - After the Reserve pile has been depleted, the Stock card can be turned over without restrictions (i.e., even if there are multiple open spaces on the Tableau or Tableau cards that are playable to the Center). When you’ve played all required moves and can’t or don’t want to make any more moves, place the hand STOCK card on the Waste pile and your turn ends. When either player has played all of their Reserve, Stock and Waste pile cards, the game ends and that player is the winner. A game match point amount can be set so that the match winner is the player who reaches that number of points first. See Match Games for details. If the rules aren’t followed precisely, a STOP will be called and the player will be prevented from making the move. Spiteful Bank contains a Tutorial that will show you how to easily get started playing.